I was told I made Fleetwood Town sound like Barcelona after a recent appearance on Sunderland’s fan podcast Roker Report. But while these teams were clearly poles apart from the best in the world, this truly was a fine advert for League One football. Joey Barton has rightly said his Town side are not getting the plaudits they deserve outside the north-west but now you feel people are sitting up and taking notice. He might as well have written the Town team talk. Dean Marney has played at the huge Premier League stadia with Burnley. Paddy Madden has scored in a play-oﬀ final at Wembley. Rangers loan star Jason Holt has featured in the Old Firm derby. This Town team is also littered with Championship experience. The club is a world away from its non-league roots. A game in front of 29,000, 3,000 more than the population of Fleetwood, might indicate the David v Goliath match Rowell previewed. But a look at Town’s team sheet shows it was far from that. Barton was disappointed not to take the three points but also satisfied his players had proved his point that they are slightly better than the Black Cats man for man. bus and entered the pitch a rarity in League One. There might have been snarls around the ground but that was not the case inside as a lovely steward helped ease my vertigo in the impossibly high press box. Town recovered after a rocky start that saw Lynden Gooch fire past the post. It was that man Madden, not afraid of the big stage, who latched on to Ash Hunter’s corner and sent shockwaves through the crowd with the opening goal. They should have got the second. Ched Evans had scored five goals in six league games but for once his radar was oﬀ. If Fleetwood seriously want to challenge they have to take those chances. As is football’s way, they were punished. this visit but the blossoming central defensive relationship between Ash Eastham and Craig Morgan was disrupted when the later was forced oﬀ injured in the 23rd minute. and one lapse of concentration felled Town. for Josh Maja to beat Spurr to the punch and divert the ball home on 36 minutes, galvanising the home faithful. a penalty, unheard by referee Darren Drysdale, when Evans looked to have been tripped by Jack Baldwin. But Town were to be awarded a penalty moments into the second half. was felled by Adam Matthews. The full-back was already on a booking but, despite denying a scoring opportunity, a second yellow was not brandished – Barton not a happy chap. I always say you should never celebrate a penalty until it is scored and the pre-penalty palaver between Madden and Evans certainly did not aid Town’s chances. Evans wanted the spotkick; Madden is Town’s penalty-taker. Jon McLaughlin smelled blood and became the first keeper to save a penalty at a Black Cats home game since 1989.
couple of efforts wide, while Evans should have hit the target from a cute Marney set-piece. Town were on the ropes in the last 10 minutes but keeper Alex Cairns stole the show. Jack Baldwin somehow blasted over from close range but Cairns showed why his manager dubbed him the best in the division with a fine reﬂex save to thwart substitute Jerome Sinclair. The ex-Leeds man ensured Fleetwood Town left Sunderland with the point they deserved. 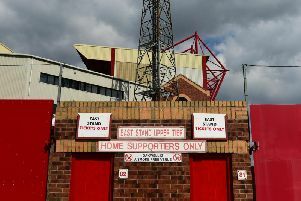 When these sides meet again on March 23 at Highbury the David and Goliath tags may well be rolled out again, even for a battle between two sides sharing the same aim of promotion to the Championship. Town showed they had learned lessons as they clung on at the death with a display of spirit, desire and endeavour in front of 474 travelling fans. Imagine what would have happened if Fleetwood had packed their shooting boots. Not quite Barcelona but now a world away from non-league.